Winter in Utah is beautiful! But it can also get cold and a bit dreary (think 2 week long inversions in the valleys). So here is a fun list of 40 fun things to do in Utah in the winter that will keep you and your family having fun all winter long! Go to a Hockey Game - The Grizzlies play at the Maverick Center in West Valley City from October to April. If you've never been to a hockey game, it's fast-paced and exciting! You can get discount tickets for up to 50% off on www.utahcoupons.com. Build a Snow Fort - A lot of heavy wet snow is perfect for building a snow fort. Check out this article by My Teen Guide, or pick up some of these Snow Blocks to help you make an amazing snow fort. Eat a Pomegranate - My family looks forward to eating pomegranates during the winter months. Learn how to pick and de-seed a pomegranate here. Visit Midway Ice Castles - It takes weeks and weeks to build the amazing Ice Castles located in Midway. They are especially beautiful all lit up at night! This attraction opens tomorrow, January 5, 2019. Get tickets here. Go Ice Fishing - For more information about the best lakes in Utah for ice fishing and ice conditions, visit Utah State Wildlife for details. Have a Board Game Night - Love sitting near the fireplace and playing board games with my family when the weather is cold. Playing board games teaches kids to take turns, strategy, teamwork and how to win & loose. Head over here for our favorite Tips and Tricks For A Successful Board Game Night. Also, check out my family's favorite board games here. Go Snowmobiling - Don't think that just because you don't own snowmobiles that you can't explore Utah's beautiful mountains during the winter months . You can rent snowmobiles from various companies throughout Utah. It's a splurge but something to consider for your next winter "staycation". Try a New Exercise Class - There are tons of deals on exercise classes and gym memberships in January but don't forget that Groupon usually has a good selection of deals too. Check out these Groupon deals for exercise classes. Set Goals for the New Year - I don't really like resolutions but I do think it's a good time to set some realistic goals. Just a Girl and Her Blog, has a great free printable worksheet to help you set and reach those goals. Read a Book - Sitting on the couch, snuggled in a blanket, reading a book while the snow falls outside is a great way to spend a winter evening. If you are looking for a book recommendation, check out these best sellers at Amazon. Drink Hot Chocolate - A hot chocolate bar is a fun, inexpensive way to entertain during the winter and warm up after enjoying time out in the cold. Volunteer - There are plenty of volunteer opportunities all around us. Some places that need volunteers are the food banks, animal shelters, elementary schools, homeless shelters and The Ronald McDonald House. It can also be as simple as shoveling someone's driveway after a storm. Sleigh Ride - Dashing through the snow..... it's fun for families or a date night. Find out how to get a sleigh ride in Midway, UT here! Make a Bird Seed Feeder - This is an easy craft for kids to make that also benefits our feathered friends. Go here for instructions. Build a Snowman - You have to build a snowman at least once every winter, it's a rule! Free Day at the Zoo - In the winter, the Hogle Zoo is free on the last Wednesday of the month from November through February. Go Sledding - One of the great things is that sledding doesn't cost much money. There are so many free sledding hills around the state. We've made it easier to find a good sledding location near you with our Mega List of Sledding and Tubing Spots. Homestead Crater - Winter is a great time to take a soak in the Homestead Crater in Midway. See Groupon for a discount for 2, 4 or 6 people. Sundance Film Festival - Utah's most famous film festival happens every January in Park City. If you don't want to buy tickets to the screenings, it's fun just to "star gaze". Check out our list of 6 Things to Do At Sundance With The Family & On The Cheap. Polar Plunge - If you are adventurous, Special Olympics is hosting 5 Polar Plunges around Utah during the winter of 2017. Go Skiing - After all, we do have the greatest snow on earth! Ski Utah is full of great information and resources whether you are an expert or a first timer. Plus, if you have a 5th or 6th grader they can get discounted Ski Passport here. Make Paper Snowflakes - There are some really cool snowflake designs on Pinterest. Some of my favorites are these Star Wars Snowflakes by Anthony Herrera Designs. Tracy Aviary - Tracy Aviary offers $1 admission the first Wednesday of the month from November through February. Go Snowshoeing - Snowshoeing is a great way to enjoy the mountains during the winter even if you don't like to ski or snowboard, it's also great exercise. Check out this Groupon for a guided snowshoeing tour. Watch the Super Bowl - Whether you watch the Superbowl for the football or for the commercials, you need good eats like this yummy Fiesta Ranch 7 Layer Dip. Visit a Museum - Museums are a great idea for a cold, wet day and Utah has some awesome museums for both kids and adults. One of our favorites is the Natural History Museum of Utah where you can get in for $5 on Wednesdays after 5 pm. Ice Skating - If you are near Davis County, there is a great deal on Groupon for ice skating at the South Davis Rec Center or in Utah County check out this deal for Ice Skating at Hee Haw Farms. Organize Your Home - The new year is a great time to get organized. Check out our Budget Organization ideas here. Plan a Spring Get Away - If you are planning a Spring getaway, check out Joani's travel blog, 50 Roads, for budget friendly travel destinations and tips. Have a Spa Day - If you can't afford to go to a spa, you can treat yourself to a DIY spa day at home. Get some great ideas on How to Have a Spa Day at Home over at One Good Thing by Jillie. Try Snowboarding - If you like to ski but have never snowboarded, then make a goal to try it this year! Go to a Jazz Game - It's always fun to attend a Jazz game at Vivint Smart Home Arena. The Utah Jazz play from October - April. Make Valentine Cards - Handmade Valentine's are a fun to make and chances are you have all the supplies you will need to whip up some cards for your Valentine! Make a Memory Book of the Last Year - Watch Coupons 4 Utah for current deals on memory books. It's always smart to organize your memories while they are fresh in your mind. Check out this deal for a 20 page-hardbound photo book here. 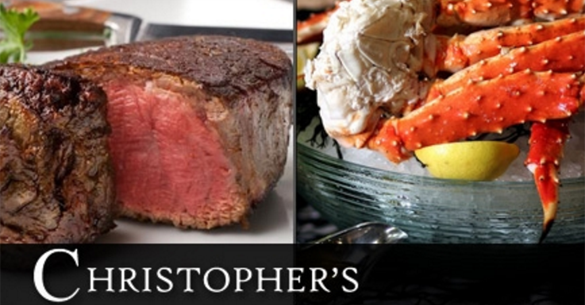 Try a New Restaurant - We currently have a great deal on a fabulous restaurant, Christopher's Prime Tavern & Grill. Check out the deal here. Paint the Snow - The SITS Girls have a great tutorial for making DIY snow paint. I can't wait to do this with my kids! Make Winter Cookies - Nothing warms up a cold day like baking cookies. Pull out the cookie cutters and bake some winter cookies, like these yummy snowflake sugar cookies. Snowball Fight - Sometimes you just have to let your inner child come out and have a snowball fight! We hope this list will help you to enjoy Utah and it's amazing winter scenery and opportunities!